Rotary Club of Sherborne Castles Fundraisers Limited have announced that they have become the Charity Partners for Powerman UK which comes to Sherborne on Sunday 11th August 2013. President Nick met up with the Trustee/Secretary Ian Dodds of RCSCF last Friday to seal the deal with Events Crew who own the franchise and will be organising the duathlon event. 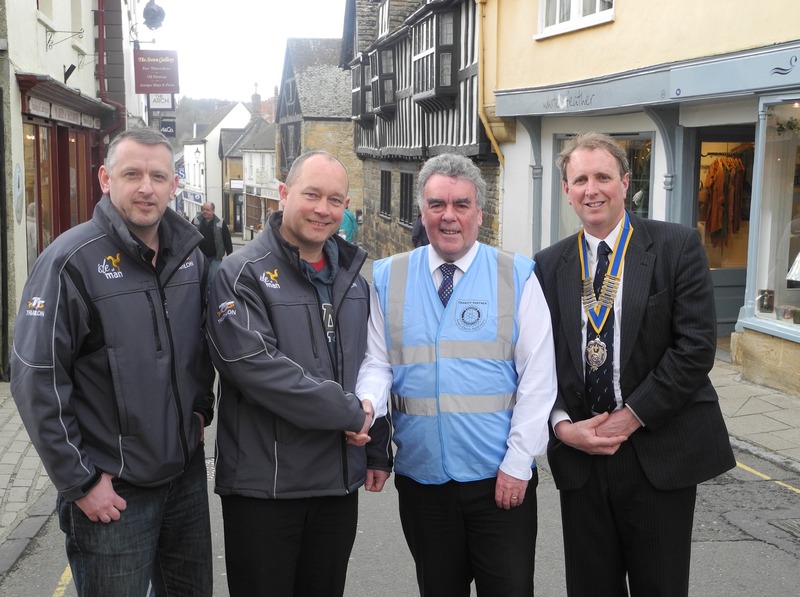 They are pictured with Director Brent Mitchell and Race Director Richard Wallace of Events Crew in Cheap Street where the event will start and finish. Powerman UK is a natural successor to Ironman UK as far as Sherborne is concerned. Being a duathlon no swimming is required so the need for the lake at Sherborne Castle is eliminated. The bike and run courses from Ironman UK remain virtually intact. The format however is different. Powerman UK consists of a 10Km Run – 60Km Bike – 10Km Run. If that is not tough enough competitors can sign up to a Long Course version a 10Km Run – 120Km Bike – 20Km Run. The Terrace will be the transition point for all the run and bike changeovers. It will also be the main competitor car park and registration area. 2013 will be very much a trial event as with the relative short time left to the event itself many athletes will have already made their plans. It is hoped that sufficient entries will be received to enable all the facilities and organisational requirements to be tested and firmed up ready for a full blown event in 2014. The winners from the event will qualify for the World Championships in Zofingen, Switzerland. Previous Entry We are all choc’d out!